For the crew of Amer Sports One, the end of the fourth leg of the Volvo Ocean Race has been a bitter experience. After risking everything in the Southern Ocean to stay in touch with eventual leg winner and overall leader illbruck, they figured they had earned second place. 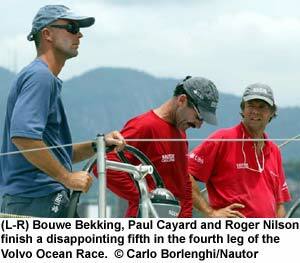 To watch three boats steal past them almost within sight of the finish was crushing. Illbruck, long-established as the boat to beat in the Volvo Ocean Race, found a path through the capricious breezes off Rio to rack up her third leg win at 0558.42 local time on 19 February, after 23d 5h 58m at sea. Amer Sports One acknowledged their achievement (“Good for them, they deserved it after leading for so many days” said tactician Paul Cayard) and set about claiming second. First to smell the vapour was Knut Frostad’s djuice dragons. The Laurie Davidson-designed Norwegian entry slipped past, was lost in the twinkling lights of Copacabana and, at 1152, claimed the second place that Cayard was so convinced belonged to Amer Sports One. Kevin Shoebridge’s Tyco deepened the gloom on Amer Sports One when she slipped through to take third at 1304 while Dalton and Co. were heading away from the line to avoid parking again. When Assa Abloy took fourth at 1422 the frustration must have been all but unbearable. Their exquisite torture came to an end at 1450 and a visibly despondent crew crossed the line, dropped the sails and motored slowly into the race Village at Rio’s Marina da Gloria. 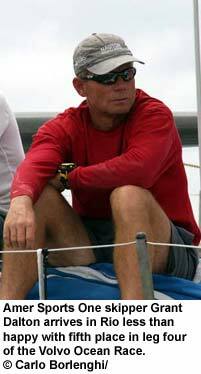 “The approach to Rio is notorious for its fickle winds,” said skipper Grant Dalton. “The fleet could see that a lottery was likely in the last 24 hours and that’s what happened. Unfortunately we didn’t have the winning ticket. The disappointment will fade as they work through a long job-list over the next few days. They will start leg five – to Miami – in second place overall with 22 points and no doubt aching to close the seven-point gap between themselves and overall leader illbruck. Assa Abloy, rejuvenated under the leadership of skipper Neal MacDonald, holds third overall on 20 points ahead of the hobbled News Corp on 19 points. With Tyco on 18 points, and djuice with 17, the battle for a podium place is really heating up.